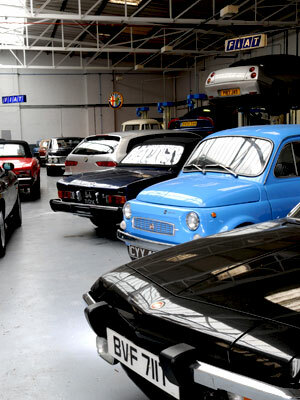 DTR have a long established reputation for the service and maintainance of not only modern or classic Fiat and Alfa Romeo, but also classic Lancia and Ferrari to the very highest standards. As restorers, we understand the requirements of our customer’s cars, whether 50 years old, or brand new. Our all encompassing range of services includes not only routine service and bodywork (all carried out in house of course), but also MoT, with the very latest Automated Test Lane installed at our new Coulsdon premises. We quote for all services before the work commences. All estimates are free of charge, (although a full inspection with a written report is £80 + VAT – very useful if you are buying a used car!). We have many customers who have used our range of services for the last 20 years and wouldn’t think of going anywhere else. So whether it is a new Fiat Panda, or a 1950’s Alfa Giulietta, we believe that you car will receive the specialist attention it deserves. DTR also carry the latest computerised diagnostic equipment, which covers most makes (which we are also happy to maintain). We have modern loan cars available when booking in, or a Wi-Fi waiting room if you would rather watch us at work! Our hourly rate is £80 + VAT for mechanical work (discounted for contracted restoration) for modern and classic vehicles. MoT at the current statutory rate of £54. Upholstery and re-trimming quoted on a job basis. Please call us on 0208 645 5050 or fill out the enquiry form to book.